Neutrinos, the ubiquitous daughters of the weak interaction, start their universe-traversing lives as one of three varieties: νe, ν μ, or ν τ. However, like ghosts with an identity crisis, these phantasmal particles find themselves constantly morphing from one variety to another, or oscillating, as they propagate on their long journeys. Now the MiniBooNE experiment has found that antineutrinos, which should follow the same rules as neutrinos, might oscillate in a slightly different way. The results seem to favor a much-debated antineutrino result obtained by the Liquid Scintillator Neutrino Detector experiment in 1990. The MiniBooNE experiment studies these oscillations by creating intense beams of muon neutrinos and antineutrinos, and directing them at an 800-ton sphere filled with mineral oil and located a half a kilometer away from the beam's source. The vast majority of these particles pass through the detector unscathed; however, a few unlucky voyagers pass too close to a carbon nucleus. The neutrinos, or antineutrinos, interact with carbon nuclei, giving scientists a glimpse of the particles' true identities. MiniBooNE counts how many muon antineutrinos oscillate into electron antineutrinos over a relatively short distance. A 1990 result from the LSND experiment at Los Alamos, which used a beam of muon antineutrinos, reported electron antineutrinos appearing about 0.25 percent of the time. The result is difficult for scientists to reconcile in a world with only three active neutrinos. 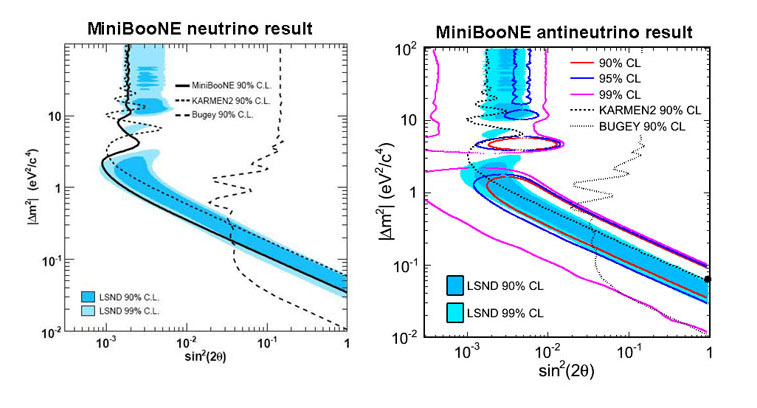 Earlier this week, after nearly three years of running in antineutrino mode, MiniBooNE collaborators announced that they had obtained a result consistent with the findings from LSND. In fact, analyzing the data in the context of a standard two neutrino mixing model favors an LSND-like signal at a 99.4 percent confidence level. However, model-independent tests show there is still a three percent chance that background fluctutations could mimic the data. While this new result is intriguing, a confirmation of LSND will require more data. 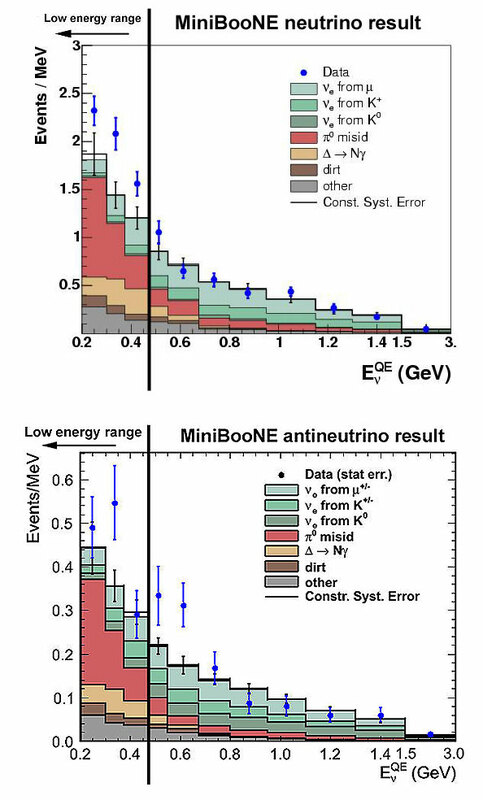 Interpretations of the latest MiniBooNE results are complicated due to an apparent difference between the way neutrinos and antineutrinos behave. In a prior analysis based on four years of running with a beam of muon neutrinos, the MiniBooNE experiment did not observe significant evidence for muon neutrinos oscillating to electron neutrinos in the energy range expected under the simplest models for explaining the LSND result. However, an excess was observed at lower neutrino energies (below 475 MeV) at a 3 sigma significance that remains unexplained. Interestingly, the MINOS results announced earlier this week also raises the question as to whether neutrinos and antineutrinos behave differently. The MiniBooNE experiment continues to acquire data, and scientists on the project are hoping to nearly double the antineutrino statistics before the experiment finishes acquiring data within the next two years. Future experiments, such as MicroBooNE or BooNE, a proposal to build a second MiniBooNE detector at a near location, could help to shed more light on these results. 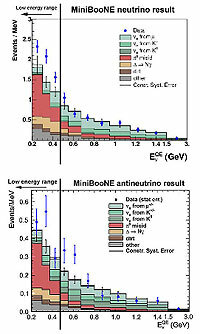 A comparison of the energy spectrum for MiniBooNE electron neutrino (top) and antineutrino (bottom) candidates. The MiniBooNE experiment has found that antineutrinos, which should follow the same rules as neutrinos, might oscillate in a slightly different way. Data is shown in blue points and compared to expected backgrounds. Data is taken with 6.5x1020 (neutrino beam) and 5.7x1020 (antineutrino beam) protons delivered to the MiniBooNE target. Statistical errors are shown on the data points, while systematic uncertainties are plotted on the background. Allowed regions of parameter space after fitting MiniBooNE neutrino and antineutrino data to a two-neutrino mixing hypothesis for reconstructed energies greater than 475 MeV. Left plot: the region of parameter space to the right of the solid black curve is excluded by MiniBooNE at a 90 percent confidence level for a neutrino beam. Right plot: the regions of parameter space allowed by MiniBooNE's new antineutrino data are contained within the colored lines shown. Both plots have been overlayed with regions excluded by the KARMEN2 and Bugey experiments, while the regions preferred by LSND are shaded in blue.